Easter Bunny Cheese Ball is delicious and easy Easter appetizer! This Easter Bunny is fun and festive version of classic cheese ball recipe with cream cheese, Cheddar cheese, Ranch seasoning mix and crumbled bacon. This Easter Bunny Cheese Ball is perfect addition for your Easter menu, and for dessert I suggest my Easter Chocolate Lasagna and Homemade Reese’s Eggs! Cheese Ball is always good idea for quick and easy holiday appetizer! It’s creamy, cheesy and loaded with flavor! Everybody like delicious Cheese Ball served with crackers or veggies. It’s favorite snacks before or between big meals for holiday gathering. Cheese Ball Recipe is simple and easy to make with a few simple ingredients. My favorite flavor combo is Cheddar cheese and cream cheese seasoned with dry Ranch mix. But, cooked and crumbled bacon take this cheese ball recipe over the top! Cheese ball recipe takes only few minutes to make. Beat softened cream cheese and dry seasoning mix, then mix in shredded cheese and crumbled bacon. To form a ball, transfer the mixture onto large piece of plastic wrap, pick up the ends of foil and twist to form the ball. You can make cheese balls a few days before serving. It’s great that you can make this recipe ahead, and store in the fridge until ready to serve. Since holidays and large family dinners or gathering means that you’ll have a lot of food to make and a lot of things to do in very short time, it’s perfect to do as much as you can in advance. Making food for Easter and hosting large family dinner or lunch can be too stressful. Therefore, quick and easy Easter recipes is something we all appreciate. Easter Bunny Cheese Ball is one of those quick and easy Easter recipes, too. Cheese balls are party staples, but this cute Easter Bunny is going to be the hit for Easter! You can make it a few days ahead and assemble it right before serving! 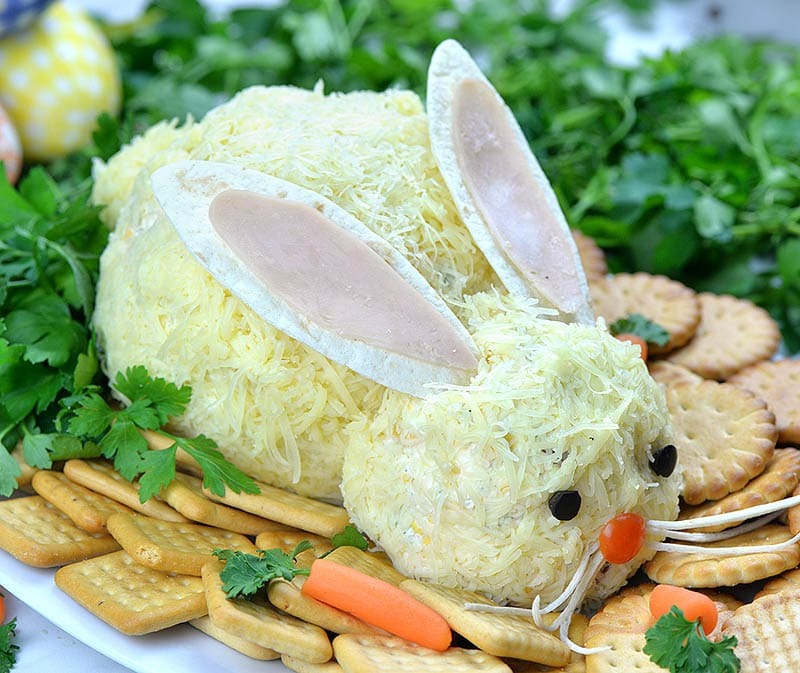 Easter Bunny Cheese Ball is just a classic cheese ball recipe dressed up into adorable, fun and festive holiday bunny. It’s almost too cute to eat! To make the cheese balls, beat softened cream cheese and dry ranch seasoning mix until smooth and creamy. Mix in crumbled bacon and 2 ¼ cups of shredded cheddar cheese. Form two balls, one small for the head and large for the body. Since the mixture is sticky, the easiest way to form the balls is to use two pieces of plastic wrap and two bowls (one small bowl about 2-3 inch in diameter for the head and larger about 5-6 inches in diameter for the body). Line each bow with a large piece of plastic wrap leaving foil hanging over the bowl. Divide the mixture, then lift the foil and twist the ends to form the ball. Refrigerate until firm. You can make this ahead and store in the fridge wrapped in foil up to 3-4 days. Unwrap the cheese balls and roll into shredded white cheddar cheese. Save leftovers of shredded cheese for bunny tail. Place on serving plate and press the head against the body to stick. To decorate Easter bunny, using a scissors cut out bunny ears. From a slice of ham cut the pink part for the ears. 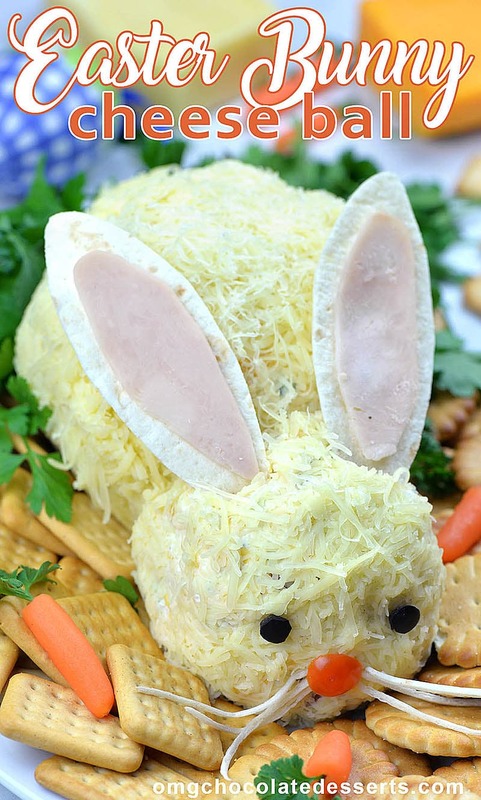 Spread thin layer of cream cheese on ham to help it stick onto tortilla ears, then stick the ears into bunny head. Cut out two small circles from black olive for bunny eyes. You can use peppercorn for the eyes instead. Press onto head to stick. Make the bunny nose from small cherry tomato or red pepper. Cut 6 strings from tortilla for bunny mustache. First press the mustache, then stick the nose. Roll about 1-2 tablespoons of shredded white cheddar into a ball to make the tail and press on the back of the bunny.